The kids have continued to want to read some of the books I reviewed here over the past couple weeks. But we have also mixed in a few others this week, so here are some of the books we've been reading. Wes Gets a Pet by Susan Blackaby is the early reader C has been reading this week. This is a cute book about a boy who wants a pet, and it takes the reader through several different options, like a bird, rabbit, fish or dog. This is part of the Read-It! Readers Purple Level, which is a great level for him. He stumbled over a few words the first time or two that he read it - words like bubbles and trouble. But after just a couple reads, he was able to read the whole thing without any problems. 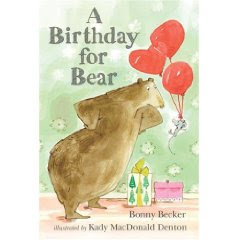 I picked up A Birthday for Bear by Bonny Becker after seeing it on Maw Books Blog because M loves birthdays. But this is a much longer book than I realized. So we've been reading it to C instead. He has really enjoyed it. It's a fun story about Bear, who does not like birthdays. But Mouse does everything he can to make Bear's birthday special. It's a chapter book, but with short chapters and relatively simple language. It's obviously meant for an early reader, although it will be some time before C is ready for it. 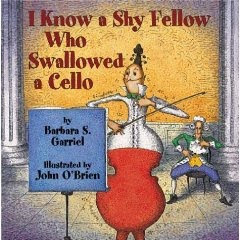 I saw a review of I Know a Shy Fellow Who Swallowed a Cello by Barbara S. Garriel on a blog recently (unfortunately I can't find it now) and knew I had to get it for C. He has always loved music, and he loves I Know an Old Lady Who Swallowed a Fly, so it was a good mix. The book is a funny version of the Old Lady story, with a very unique illustration style. It's also a great introduction to many different instruments and the types of performances where they appear. For example, the cymbal comes from a marching band and the saxophone comes from a jazz band. The last book is one C got from his school library last week. 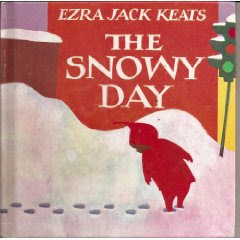 It's The Snowy Day by Ezra Jack Keats. This is a sweet story of a boy who wakes up to see snow outside, and spends the day exploring the snow by himself. He makes tracks in the snow with his feet and a stick. He builds a snowman and makes snow angels. The illustrations are very simple to go along with the simplicity of his exploration. It's a lovely story that also includes some funny surprises, like when he hits a branch with a stick and the snow falls down on his head. I really enjoyed reading this to C, and he enjoyed hearing about all the different things a boy can do in the snow all by himself. What have you been reading with your children this week? Hop on over to Mouse Grows Mouse Learns to share! The Snowy Day would be perfect for us today - if only the library was open! I'm going to have to find the Cello one. I love the "I know an...." books, and have a couple of different versions. I have to find the Snowy Day - I saw so many good reviews about it.